For over 40 years Nihon Kohden has developed its hematology expertise. The first hematology cell counter by Nihon Kohden was created in 1972. Over the years, the models launched included more extensive and advanced capabilities. Now with Celltac G, the new genuine generation of Nihon Kohden’s Celltac brand is available giving excellent performance in mid-sized laboratories. The DynaHelix Flow technology perfectly aligns WBC, RBC and PLT cells for high impedance counting precision using advanced hydrodynamic-focused sheath flow before passing through the aperture. In addition, the DynaHelix Flow totally prevent risk of coincidence or count of blood cell re-entry into the aperture using unique DynaHelix Flow stream. This newly-developed advanced DynaHelix Flow technology greatly improve counting precision and accuracy. 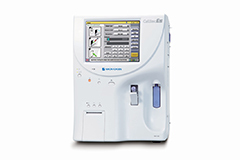 Celltac G’s DynaScatter Laser optical technology truly analyzes and differentiates WBCs in near-native state. The innovative 3 angle scatter detector provides better detection of WBCs using precise light scattering measurement. We obtain WBC size information from a small forward angle (FSS), information of cell structure and complexity of nucleo-chromatin particles from a large forward angle (FLS), and internal granularity and globularity information from a side angle (SDS). This 3D graphic information is calculated by the exclusive Nihon Kohden software algorithm. Celltac G’s fully-automated random access walk away loading system enables up to 90 tests per hour by just continuously inserting the color-coded racks on the system. Celltac G’s HL7 based information system enables seamless bi-directional information transfer to laboratory information systems. Celltac G’s reagent management system helps easier reagent bottle management. With this feature, testing quality is always maintained at high standard level. Celltac G provides complete traceable QC records that meet laboratory accreditation requirements. In addition, reagent management report, maintenance report, calibration history report, analyzer’s daily self-check report and many other reports or logs are always stored using internal memory for evidence of compliance for laboratory accreditation requirements. Celltac G Smart ColoRac Match helps fast and easy location of clinically abnormal tubes as well as scan-failed barcoded tubes using the unique color-coded rack system that is associated with data management software on the analyzer. This unique user-oriented Smart ColoRac Match system enhances lab's efficiency without extra investment, extra space and special operator training. The Smart ColoRac Match surely maximizes lab’s productivity for faster and more accurate test report.